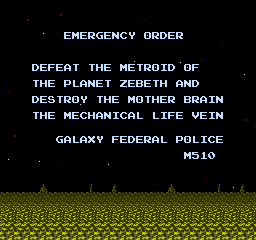 "Wait, you mean The Metroid is a girl?" 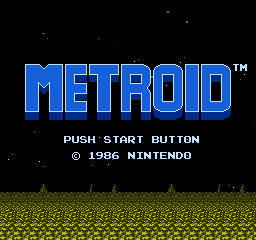 Now that Paladin's Quest is over with, it's time for me to change course and look at something a bit more iconic: the Metroid series. 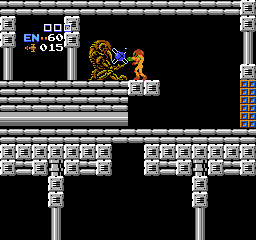 The first Metroid I played was Metroid 2: Return of Samus in 1993, but I soon heard legends and tales that an earlier game existed in the then-duology. 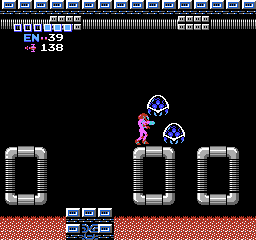 To say I was captivated by the idea of an NES Metroid would be an understatement, but unfortunately for me I never got to play this game until I eventually got an NES in 1999. I recently revisited the game for the second time for the purposes of this post. This is one of the best (and most difficult) classics to be found on the NES. Read on to see my thoughts as I play this fine work of game design. 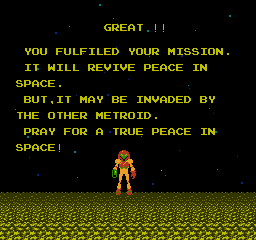 One of the things I like about old video games: the awful translations. Oftentimes these games would only have something like one or two screens of dialogue and wouldn't even be able to get the text right for that long. Did they hire their translators off the street? What's a mechanical life vein, anyway? ...swimwear-clad Samus with full energy tanks, missiles, and the Wave Beam, in Norfair. Not sure how much of the game itself is completed at this point, and I'll be playing it the normal way. 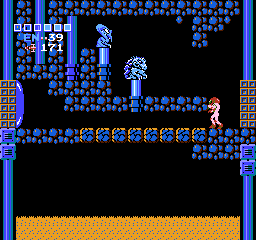 But this brings me to one of the worst-kept secrets in gaming during that era: Samus (or "The Metroid" as some confused people once called her) is actually a lady. The game begins for real! This shot is iconic. You start off with your energy 30% full and a beam that basically fires at melee range. Good luck getting past the first ten minutes of the game! 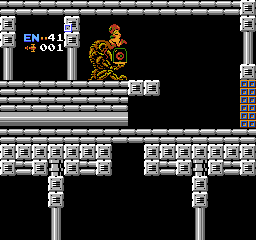 Woe to you if you go right from the outset, because immediately to the left is perhaps the most important powerup in the entire Metroid series, the morph ball. 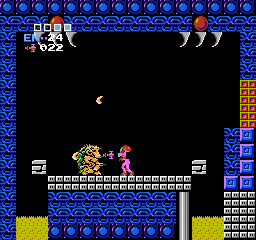 This game doesn't let you duck (a fact that becomes apparent when you can't hit the low-to-the-ground foes in the first couple of rooms) but the morph ball is the next best thing. Like vertical tunnels? This game has lots and lots and lots of them. 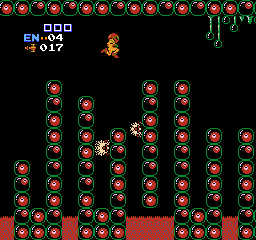 The diagonal tunnel wouldn't be invented until Metroid 2, so the only way for this game to change elevation was to make you traverse overly-long vertical tunnels. I acquire the first energy tank of the game at just the right moment. That was a close call. The first missile of many. This game has a very unique look for an NES platformer and even at this early stage it conveys a certain level of mystique. 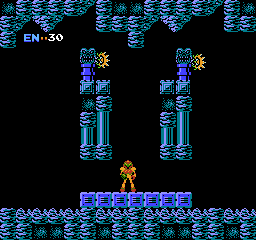 The next major powerup is the Long Beam, which lets Samus fire all the way across the screen. This should have been the case right from the outset and I'm not sure why it wasn't. Here's Norfair, the land of fire and glass bubbles. 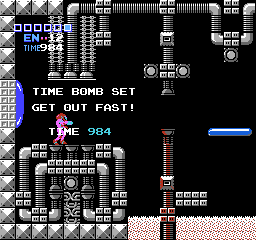 Samus acquires the Bombs, which open up numerous new areas to explore as well as put Samus on the Homeland Security watch list. Now we're cooking with gas, as I get the Ice Beam and use it to get more energy tanks, like this one near the beginning of the game. Look at that bastardly seahorse hanging out in the lava. Here's the iconic Screw Attack. In addition to being the source of numerous grade-school jokes, this is the most powerful attack in the game. It's ineffective against most of the bosses, but it can destroy any regular enemy in one hit. Given that the beams in this game are relatively weak, it's a huge boon. This is one of the more frustrating areas in the game. 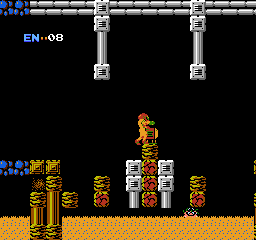 Fall off one of these pillars and you're basically dead. There's only one way to escape from the lava and it's excessively difficult. Varia suit, the last major powerup. This doubles Samus' defense. Also got the Wave Beam, the most powerful beam in this game. Given that you can't duck, the wide spread of the Wave Beam is particularly useful. Here's the entrance of Kraid's Lair, the next major area. 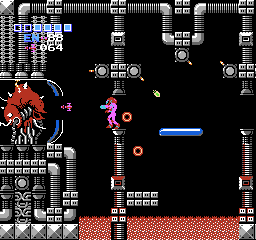 Super Metroid would feature this room, as well. 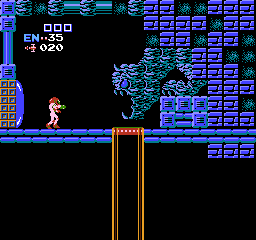 Metroid follows the pattern of many "open-world" NES games like Dragon Warrior and Castlevania II in that it gives you free reign to collect power-ups in preparation for a few major challenges. One of these challenges is said Kraid's Lair. Now that the "collecting" half of the game is done with, it's time for the battles. 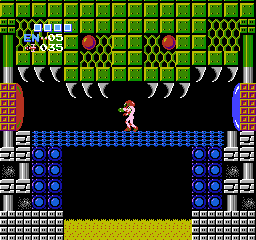 Kraid's lair is peculiar and not particularly interesting, consisting of lots of white bricks and one-way passages. ...the ceiling in this hallway. Trippy. 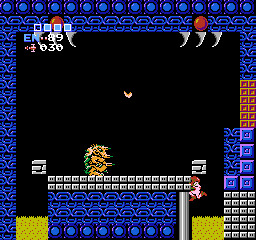 Kraid, not yet at the massive size he'd reach in Super Metroid. There are lots of ways to win this fight. Screw Attacking repeatedly, firing missiles point-blank, laying bombs, and firing the wave beam from in this pit are all effective. The last one is likely the easiest, but also the cheapest method. I go the point-blank route for the most part, and the fight is over quickly. None of the bosses in this game are difficult aside from perhaps the final boss. Ridley's Lair is the next part. Yes, Ridley is a reference to Ridley Scott, creator of Alien. 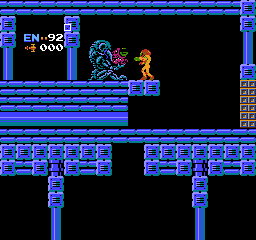 Metroid draws heavily from Alien, from the female protagonist to the face-hugging Metroids themselves. 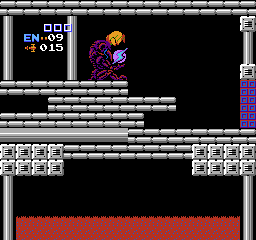 Ridley's Lair is slightly more interesting than Kraid's, full of these interesting spiral columns that also curiously appear in Metroid 2. Curiously because that game transpires not on planet Zebes, but on planet SR-388 (again, a reference to Aliens' LV-426). Here's the beast himself, the Xenomorph-esque Ridley. 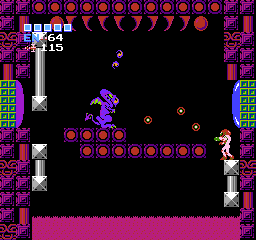 While Kraid would only go on to make an appearance in Super Metroid, Ridley would go on to make appearances in nearly every other Metroid game. If these two are famed wrestling tag-team The Rockers, Ridley is the Shawn Michaels of the group. With that, it's off to Tourian. These two statues of the bosses once blocked the way, but with said bosses defeated they move. 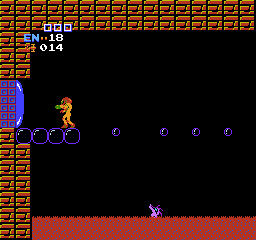 Tourian is short and to-the-point, Samus versus a bunch of Metroids. 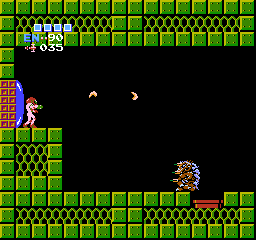 These things are pretty ruthless, and drain your energy fast if they reach Samus. The only way to pry them off once they grab ahold? Bombs. I wonder how many people didn't figure that out the first time they played and got completely owned in this area. 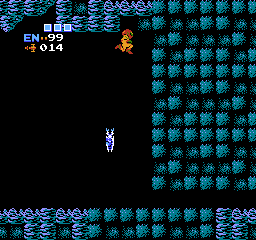 Killing these iconic fiends is a matter of freezing them with the ice beam and pumping missiles into them. They only stay frozen for a second (unlike later games where they stay frozen long enough to barely be a threat) and when they attack in groups it can get pretty rough. 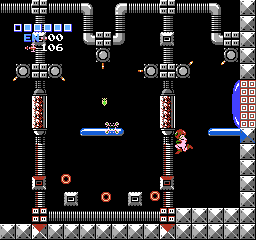 The final hallway of the game is full of glass barriers that can only be taken down with missiles. If you run out... well, you're screwed. This is definitely a "you must have this many missiles to proceed" point for the game. Luckily, if you've even been half attentive to item-collecting throughout the game you'll have more than enough. ...the fight is won. 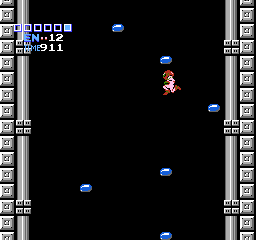 From there, it's time for a very...well, Metroid-style escape sequence. The vertical corridor that follows has tiny platforms. 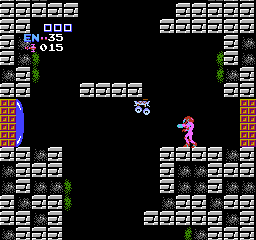 Still, tiny platforms or not, this is one of the tamer escape sequences in gaming history. You get an excessive amount of time to climb one measily vertical hallway. Worth noting? 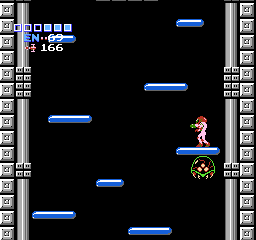 This hallway appears in Super Metroid. It must have been awesome for fans of this game, playing Super and seeing all the direct references. 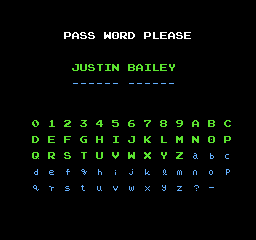 And here's the other screen of text in the game. Yeow. Bao chicka wao wao! 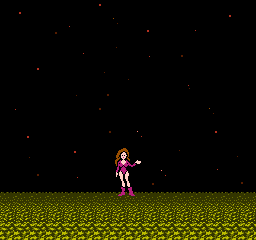 Samus takes off her armor and shows off her sweet 'bod in the finest graphics the 80's could muster. 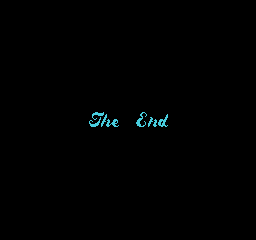 I don't know what my end time was because the game doesn't tell you, but I suspect it was around 2 hours and 30 minutes which would be about right for this ending. 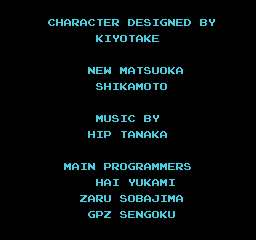 Credits roll. I just think it's awesome that someone who worked on this game is named "Hip Tanaka". Well, wait. 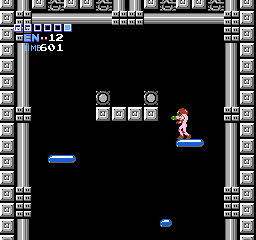 The game now starts you back at the beginning with swimwear Samus and no powerups. Interesting and unexpected! If I didn't have other things to do, I'd definitely play the game like this. 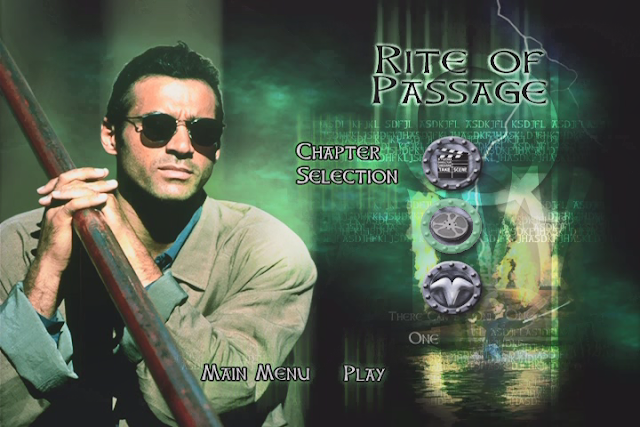 In closing, really cool old game and the predecessor for some of my favorite games of all time. Great review. You asked whether they brought in translators from the street - they most likely didn't have translators at all. All these companies would let whichever programmer had the best English get out a Japanese-English dictionary and write the translation himself so they wouldn't have to contact anyone in America or look for a foreigner in Tokyo. Hence, the translations often have the right words but the wrong grammar.